Our group at work sometimes had potluck lunches around the fall-winter holidays. 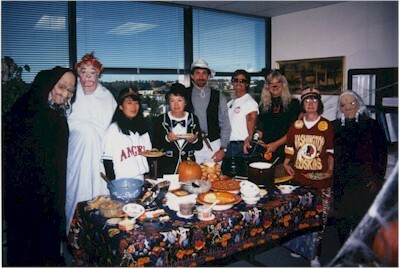 This is obviously a Halloween potluck. My guess is that it's around 1995 or 96, but I'm not really sure. You probably don't recognize me with that light blue blanket wrapped around me. I've had that mask for a long time, back before Matt was born. I think I wore it the day he came home from the hospital, Halloween day of 1986. Must have made an interesting first impression on the kid. One Halloween, I wore the mask as I greeted trick-or-treaters at our door. Kids were quite startled as I opened the door. One of them actually fell backwards in fright!